Engage your students with this fun and creative way to learn about shapes and symmetry. 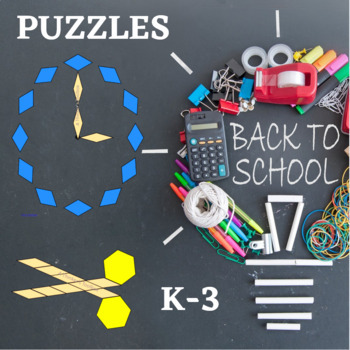 The Back To School Puzzles are a bus, pencil, scissors, and clock. Each puzzle has an easy puzzle and a more challenging puzzle. The easy puzzles shows what blocks to use and are great for Pre-K and Kindergarten. 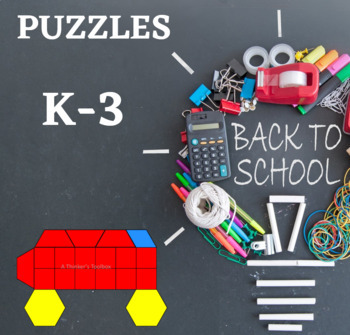 The harder puzzles only have the outline and are better suited for 1st, 2nd and 3rd Graders. You can even use the answer key puzzles for students that need extra assistance. Print on white 8.5 by 11 paper and laminate for durability. Black line pattern block pieces as well as colored pattern block pieces are provided. Colored answer keys (with watermarks) are also included. These watermarks are necessary to protect my work from copyright infringement. ~Additional License is discounted at 25% OFF! 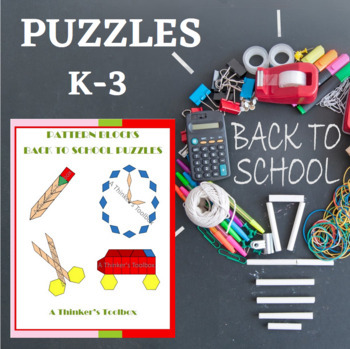 Pattern Blocks Back To School Puzzles by A Thinker’s Toolbox is licensed and can not be disseminated without my express permission.